You are buying the 16x100 10ml Vacutainer Plastic EDTA Tube Lavender 100 per bx 366643, model 366643, manufactured by BD. BD is a leading manufacturer of needles, syringes, and medical products designed for both professional and personal use. At ADW Diabetes, we offer the complete product line by BD with great savings and excellent service. 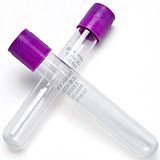 16 x 100 mm 10.0 mL BD Vacutainer plastic EDTA tube. Lavender BD Hemogard closure. See thru label.